In 2007, a book titled “When a Tree Shook Delhi” was published. I bought it immediately because the Sikh massacre in Delhi in the aftermath of Mrs. Indira Gandhi’s assassination has always rankled. In 2002 we met with the brother of an ex-colleague of Krishnan’s who was a brilliant student but was a pale shadow of himself after he saw his father being beaten up and other family members being burnt alive by mobs in the 1984 carnage. He had gone quiet and would just mumble replies…. I remember him often and with deep sadness. 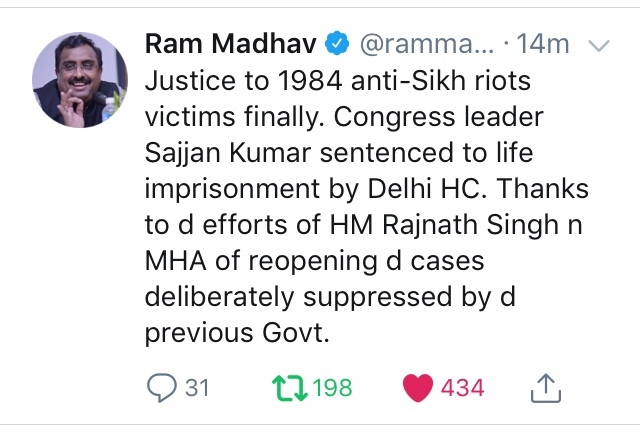 Yesterday, the first big CONgress leader was sentenced to life imprisonment till death for his role in the 1984 pogrom that killed over 3000 Sikhs in Delhi. The reason I will vote for Modi again and again is because if not for him and his government, the Sikh community would not have got this partial justice even ! It is the Modi government that re-opened the case and finally after 34 years, one of the accused is paying a small price for his role in the pogrom. Sajjan Kumar is 74 years old and he has enjoyed his life for the past 34 years while many of the victims of that carnage have suffered everyday. The CONgress has done nothing and will do nothing ever…. “….Rakab Ganj Gurdwara, despite being across the street from Parliament House, was subjected to a prolonged siege in which its periphery ws damaged, and two Sikhs were roasted alive. The attack on Rakab Ganj Gurdwara was also remarkable for the fact that it was probably the first, and so far, the only instance in the history of mass violence in India, where a political leader admitted to being on the spot. And such an instance ironically occurred in the immediate vicinity of India’s parliament. The leader in question was Kamal Nath, who was at the time of the 1984 carnage, an up and coming Congress MP from Madhya Pradesh, and is now a cabinet minister holding a key economic portfolio in the Manmohan Singh government. In a siege that lasted over five hours, Kamal Nath is said to have been there for about two hours. On the same day when Sajjan Kumar was convicted, Kamal Nath took oath as the Chief Minister of Madhya Pradesh …. 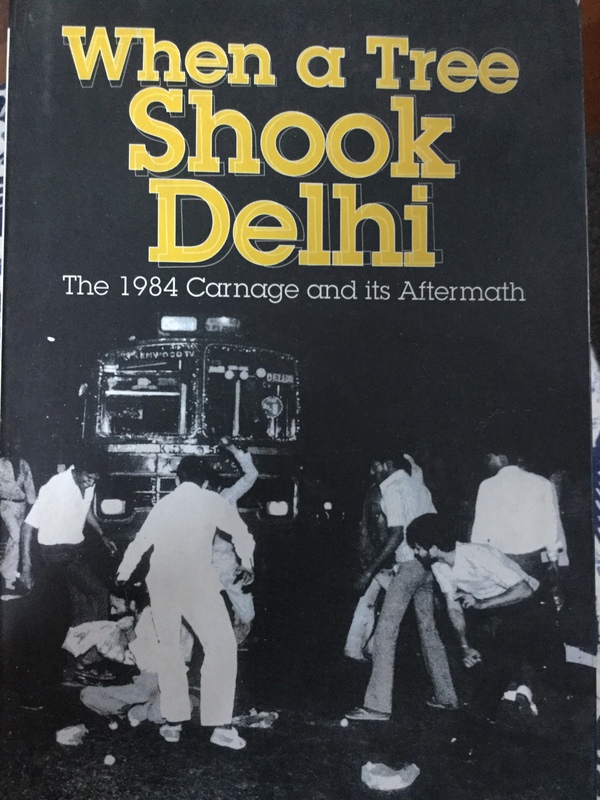 All those Sikhs who voted for Kamal Nath need to read this book and remember that every time they vote for the CONgress, they are voting for a party that shields and promotes those that led the 1984 carnage :(:(. I have had the misfortune of seeing Jagdish Tytler, the other main accused in the anti-Sikh riots, at the Delhi airport once and I would have liked to wring his neck, but I couldn’t. That man had “sinister” written all over his face. “The official report of the Nanavati Commission of the Government of India on the 1984 anti-Sikh riots found ‘credible evidence’ against Tytler, saying he ‘very probably’ had a hand in organising the attacks. The Indian government, however, decided not to prosecute Jagdish Tytler due to lack of concrete evidence.” – Excerpt from wikipedia (https://en.wikipedia.org/wiki/Jagdish_Tytler. I want everyone to pray for the long life of Tytler and Kamal Nath – so that they can be convicted for their role in the 1984 carnage. The nation owes a debt to the Sikh community and this is the only way to repay that debt. 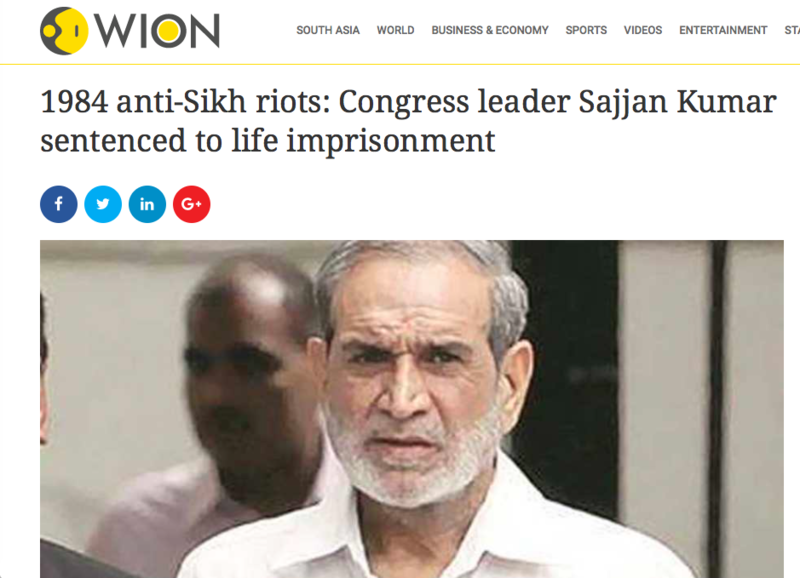 I also want people to pray for Sajjan Kumar’s long life … he must feel a little bit of the pain atleast. Four big CONgress leaders, tainted forever, but have gone about their lives happily. The surviving three leaders – Sajjan Kumar, Tytler and Kamal Nath, are all above 70 :(. #WhyISupportModi – because he didn’t forget the Sikh community and the anti-Sikh carnage of 1984. “But, when a mighty tree falls, it is only natural that the earth around it does shake a little.” … famous explanation by Rajiv Gandhi for the Sikh carnage of 1984. Well, now the Earth is being shaken and hoping a few well grown trees fall.